A brilliant new colour in Cosmos. 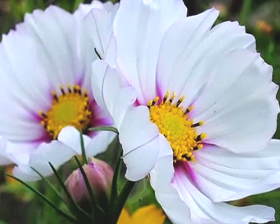 Flowers are rich burgundy in center and change to crystal white creating an attractive, two-toned effect. Very early flowering and floriferous all summer. Excellent for borders or containers. The billowy 80-100cm tall plants produce an abundant flourish of frilled 7-10 flowers. The butterflies love them. 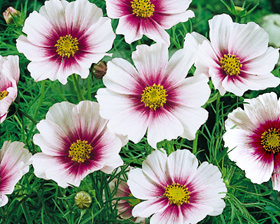 Sow cosmos seeds March to May. Sow seed on the surface of a good free draining, damp seed compost. Cover with a very fine sprinkling of compost or vermiculite. Place in a propagator or seal container inside a polythene bag and place at a temperature of 20-25C until after germination which usually takes 7-14 days.